When I was younger, I liked the outdoors sometimes, but as an adult I love the outdoors now. I recently had an awesome experience of exploring dance outdoors by the beach. 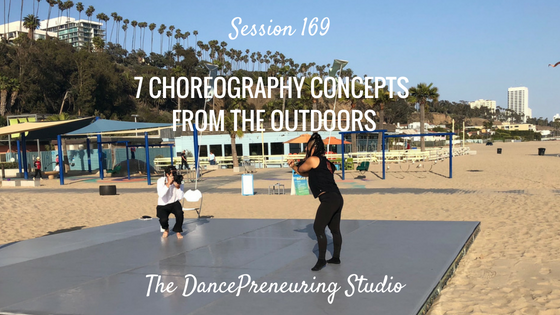 I indulged in the sun, wind and sounds around me but I also learned of 7 choreography concepts that you can apply in dance and more, whether indoors or outdoors. 2. Is there a story to tell or a question to pose? 3. How many people are interacting or not? 4. Are they doing different, related or the same thing? 5. At the same time or different times? 6. How does rhythm, speed, repetition, height, depth, angle, extension, pattern come into play? 7. What sort of sound goes with this? Music, natural sounds, talking, or silence? In the case of being at the beach, can you see volleyball players, beach joggers, kids on the swings, or maybe a cyclist on the path? From where you stand, do you see a dance? Are you part of the dance?